Although you will usually find our “reviews” on the restaurant section of our blog, (http://www.billswinewandering.com/category/restaurants/) I felt it was appropriate to review the Pure Foods Fish Market in downtown Seattle in a similar manor due to some recent experiences we’ve had. I believe there is room for improvement with the way these guys handle their loyal patrons. Our good friends Pete & Martinique live in downtown within the Harbor Steps Apartments, literally two blocks from the Pike Place Market and have been residents of downtown for many years. As their guests, we have visited the market both as tourists, as well as have gotten the inside scoop from our friends who are the “locals”. Pete, like myself loves to cook and is an excellent chef. He does most of the cooking at home and they literally shop for their food on a “just in time” concept. Pete has taken us to many of his favorite stops and swears that there is no place better to buy seafood in Seattle than at Pure Food Fish Market within Pike’s Place Market. There are numerous other fish vendors here so it would be difficult not to find what you’re looking for, but this is Pete favorite claiming that it is by far the freshest. They say say that more local shop here than tourists. During December, Bill and I visited our friends and of course made our way to the market a few times. Pikes Place Market is one of my favorite places to visit. Yes, it’s a tourist trap and it can become insane busy, but aside from the fish there are other vendors that sell fruits, cheeses, vegetables, meats, fresh cut flowers, as well as souvenirs. You can get some great food to eat and there are a lot of neat things to see. Most of the time it is a flurry of activity so the best time to go is early morning. I’ve even gone when vendors are setting up as I wake up early since my internal alarm is on the central time zone. I love to walk around while I’m free to move about without the crowds. I’ve visited with the hard working guys, who for the most part rebuild their work stations from the bottom up. They shovel and haul snow and ice; they carry and arrange an abundance of fish and product; and decorate their displays delicately with greens. The guys of Pure Foods Fish Market were mostly friendly but when they are busy, some of them tend to be brusque, curt and snippy in spite of the fact that you are their customer and wish to spend your money with them! When we had purchased fish during the trip we were pleased that we would be bringing home fresh fish; and that it would be packed for carry on to the plane. It was explained that it would stay cold for up to 48 hours! We ordered our fish the day prior to our departure so that we could pick it up quickly on the way to the airport. The shop was somewhat hectic and busy but the fast-paced, energy was to be expected. We invested about $350 into the order, but were ok with it since we are unable to get great fresh fish of these varieties in Minnesota. The guys helping us were efficient and friendly but unfortunately, the order was not ready at the time promised the next morning. The packers were then nice enough and hustled to put the order together quickly while we grabbed a cup of coffee. 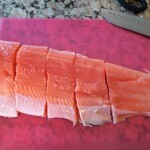 Once home, we were thrilled with the quality of the fish; the cuts of the fish and the packaging of our purchase overall. The various types of fish, including fresh manila clams smelled sweet like the ocean and were wrapped in clear plastic bags, then covered in several reusable ice packs, and were all placed in a sealed-Styrofoam container. This was then packed into another sturdy outer cardboard box that had handles; easy for carrying. The gentleman was apologetic for not being ready on time and said he had “thrown in something special”; which we think were a couple of extra jumbo shrimp. Of course, we never weighed the fish because we assumed it would be accurate. The clams were fresh and we stored them appropriately in a colander covered with ice (so that the water could drain, if ice melted) within the fridge until the next day when we prepared them. We were thrilled that every single clam opened! They were fresh and delicious! About four months later, early this April, our inventory was depleting so I thought I would take advantage of the on line shopping system that one of their mongers had assured me was of equal quality. It was explained that Pure Food Fish Market takes fresh seafood orders online at FreshSeafood.com and ships anywhere in the United States via FedEx overnight, guaranteeing freshness upon delivery. 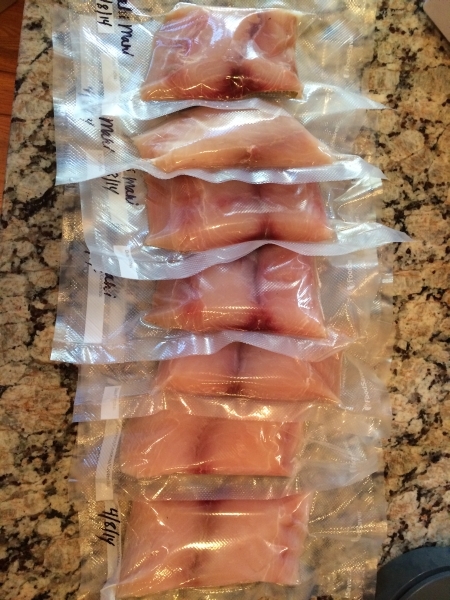 I assembled an order while at home on my computer including a repeat of some products; as well as included a few different types; King Salmon, Ahi Tuna, Halibut, and Mahi Mahi. 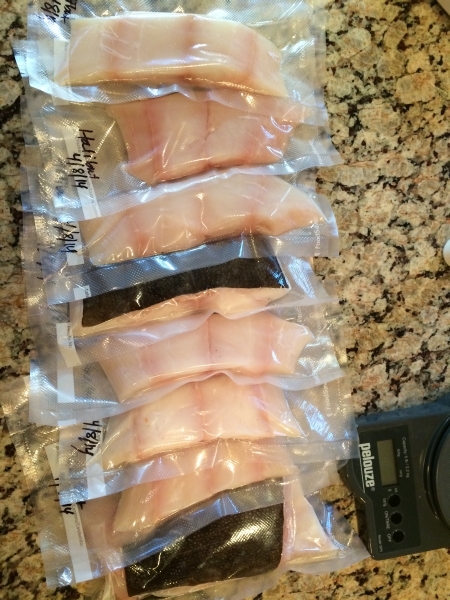 I was not thrilled with the minimum amount of (fixed pounds) fish required to purchase, but decided it would be worth it again and that inevitably it would all be eaten so I proceeded with my $423+ order (after the 10% new member discount). I was excited to see that my order would include a free sample of smoked salmon, because we hadn’t been offered that while at the store. The order arrived promptly as promised, but when I went to open the package I found myself disappointed. My expectations were high since the initial order was of complete quality. 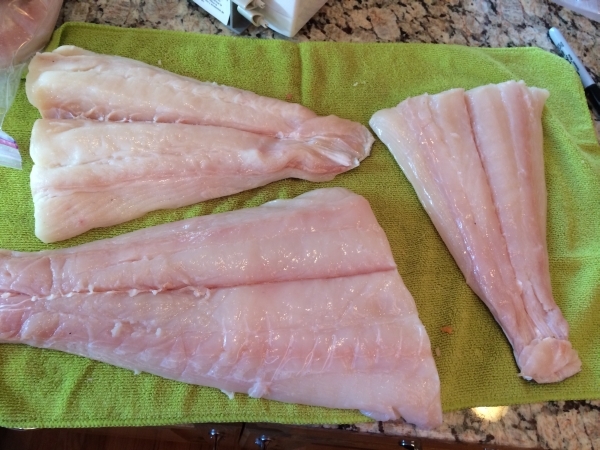 Although the majority of the fish smelled fresh for the most part, I felt sort of ripped off because some of it had an oder and the cuts of the fish were not the same. 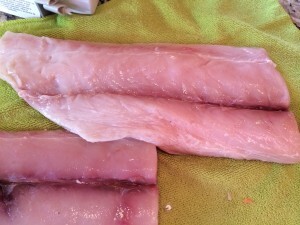 The Halibut for example, were three tail ends, with little of the thick meaty head end left for thick cut delicious fillets. It’s like in Minnesota if you buy a whole beef and the butcher steals the prime cuts of steak or fillets. Since it’s all wrapped up in white paper, the average person likely wouldn’t notice! Previously, we had received an entire “slab” or side of the fish cut just behind the head and ran entirely down to the tail. It had been folded within the package and remained in tact. We had not discussed a preference in cuts on the initial order and didn’t think to do so on line (or see a space to do so) because we assumed it would be the same as the initial order and honestly didn’t think we would have to or know that we could! The Mahi Mahi fillets had two very different colors and I queried the guys pertaining the color of the skin to decipher the fillets because they come unmarked. 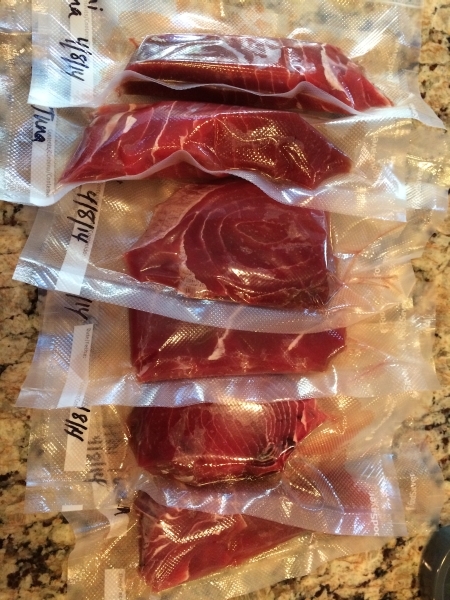 I have a lot of experience with Tuna and these fillets were very different than the ones previously received. The flesh was soft and did have a slight “fishy” oder. I know that cloudy eyes would indicate that the fish is old, but I wasn’t there to pick out my fish. Typically I would press the fish’s flesh with a fingertip. The fresher it is, the more firm it will feel and the more it will resist being pressed. If it’s easy to make an impression in the flesh, and if the finger impression stays or fills with liquid, the fish is not very fresh. 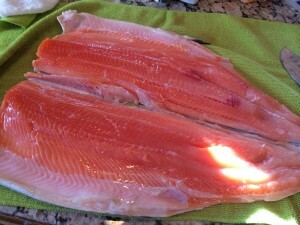 This quality of fish was not great and it should have had very little odor whatsoever! Typically when I purchase tuna, I would clean away any remaining skin from the fillet as well as any silver connective tissue. Then I’m left with a nice clean loin that is long, round, and tapered. I would cut it by starting at the thickest end and measure 1 to 1.5 inches to cut. 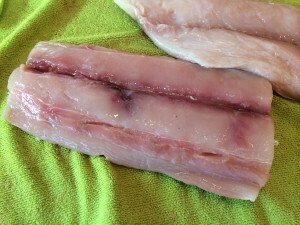 When cutting or buying a fresh fillet, one should be aware of how many white sinew lines divide the meat. These white lines in the flesh of ahi tuna indicate tough veins that you don’t want because the sinew can hinder cutting. 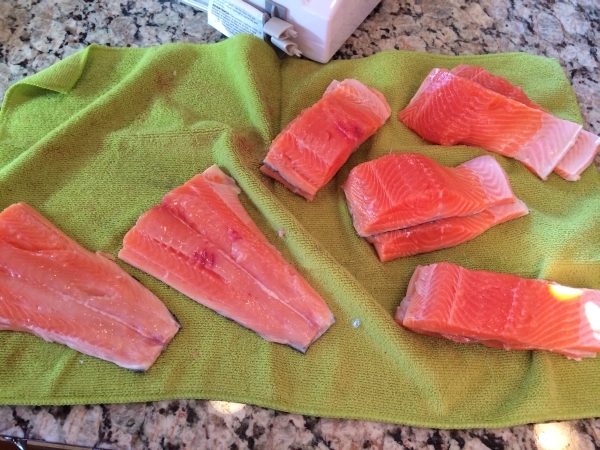 I tend to look for a cut of solid color (like the better looking fillet on the left) without veins. If you are looking for fatty tuna, find cuts with soft marbling rather than stringy-looking sinew! I immediately called the store and spoke to Tom who seemed surprised, but was contrite and handed me off to Neal, the manager at my request. 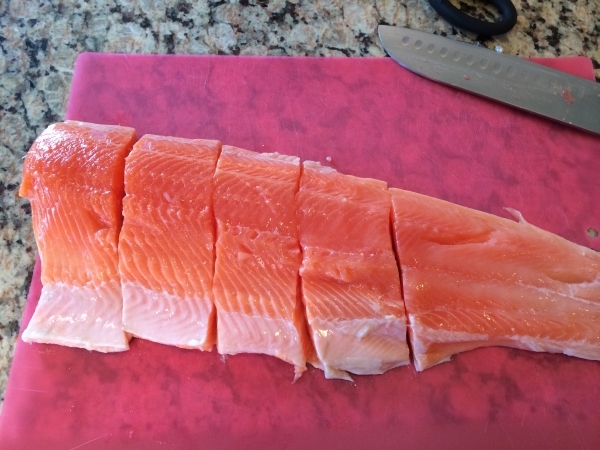 Neal did a good job of defending the quality of Pure Foods Fish Market while making efforts to appease me, but I strongly disagreed that “a lot of folks prefer the thin tail end” of fish. Unfortunately, I had not yet weighed the fish when I accepted his offer of a $100 credit on my next order because of my complaints of “crappy” cuts. I am now somewhat apprehensive about the promised credit since I looked at my on line account today and there is no $100 credit on my account. Neal also explained that they would have vacuum seal it for us if we had asked, which would have been terrific to know in advance! We literally spent an hour or two cutting and packing, plus the cost of materials using our home food sealer. (It wasn’t clear if there is a fee for this, but it may be worth it!) Neal recommended calling the store, rather than using the system on line and explained that one should specify the preferred cuts of each fish that they were purchasing in the future. Now let me tell you about the weight of our order. Keep in mind that 1 pound = 16 ounces. My scale is accurate. 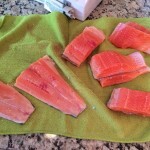 The salmon did have a little bit of waste. There were fins that had to be removed, but there was very little waste. We paid for 5 lbs. 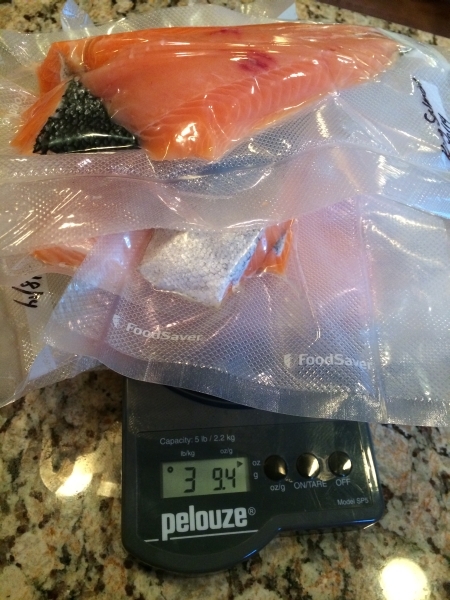 King Salmon @ $165, but only got 3 lbs. 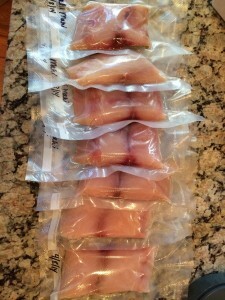 9 oz – in packages, This equates to 5 meals – 2 fillets each @ $33. WE WERE SHORTED because there is no way I tossed a pound and a half! The date on all of the fish should have actually said 4/9/14, which was the day we received it. We paid for 4 lbs. Mahi Mahi @$58 and got 4 lbs. 4 oz. – in package with zero waste. This equates to 7 fillets @ $8.29 each. I think this is a fair price for this fish. We paid for 3 lbs. 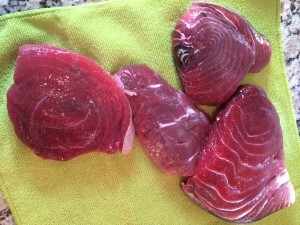 Ahi Tuna @ $52 and weighed out at 2 lbs. 15 oz. – in package threw no waste. This equated to 6 packages of varied sizes @ $8.67 ea. 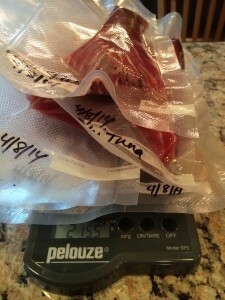 We did taste the tuna immediately because we wanted to be sure it was fine before freezing. It was alright, but definitely not the quality of the first batch and I’m still not pleased with the texture or smell. The Halibut weighed accurately at 5 lbs. @ $132.50. 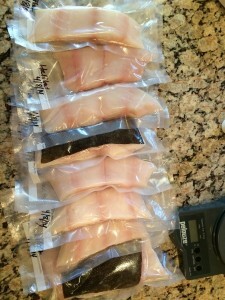 This equated to 8 fillets @$16.56 ea. Generally, we are able to split each fillet between two people and we love this fish so much that it’s worth the investment. We did not receive the sample of the smoked salmon! Other reviewers discuss that the products are really fresh, really good and overall worth the investment for excellent, fresh seafood. I would recommend you buy what is inside the counter and not what is displayed on the ice where all the customers can touch it. 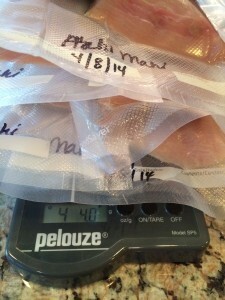 Others report that they didn’t appreciate being given a rounded up price for fish that wasn’t labeled with weight. Some wished they had a scale at home to see if they had been taken advantaged of. A number of folks said that they too felt taken advantage of and that they had consistently been overcharged. 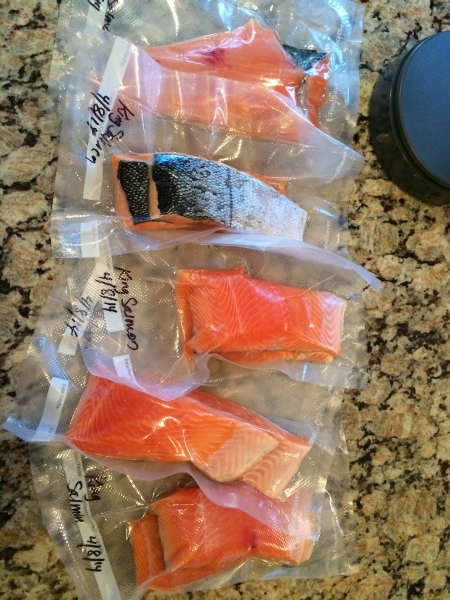 I will give them another shot providing they give me my store credit, but I really think they owe me a pound and a half of King Salmon and they should throw in some smoked salmon that I have heard so many great things about, because we still haven’t had a chance to sample any! I’m hopeful that we will be able to continue to enjoy the fabulous fresh fish that we originally experienced because living in the midwest doesn’t leave much for fresh fish options, besides the lake fish that we have to work for and it’s just not the same. Please provide your feed back with your experience with Pure Foods Fish Market, Seattle, WA.